For the delicate task of lifting jacket substructures into their vertical position, Sarens relied on four of its most trusted pieces of crane equipment. Just a little over 13 km off the Caithness Coast of Scotland, offshore construction of one of the deepest windfarms in the world has reached fever pace. The Beatrice Offshore Windfarm (Beatrice) project will be capable of generating enough electricity to power approximately 450,000 homes and reduce annual CO2 output by 938,787.8 tons. The Beatrice plan includes 84 Siemens 7MW wind turbines to generate 588MW of electricity each year. Each massive turbine is constructed with a 505-ft.-diameter rotor and total turbine height of 650.9 ft. Construction crews in this region of the North Sea will be working at sea depths reaching 180.4 ft. to anchor each turbine to the seafloor. Serving as the underwater foundation platform, jacket substructures are being constructed by Burntisland, Scotland's, Burntisland Fabrications (BiFab) at heights from 223 ft. to 265 ft. tall. The first 26 jacket substructures are currently under construction at BiFab's facility in Methil, Fife. With each turbine anchor weighing of approximately 1.1 tons, BiFab searched for a heavy lifting partner to devise an efficient, repeatable and safe plan for transporting the offshore jackets from the fabrication facility, lifting each structure into a vertical position and loading the turbine bases onto the specialized transport vessels for final positioning. For this phase of construction of the landmark deep-water Beatrice windfarm, a heavy lifting specialist was needed. To handle the heavy lifting, BiFab selected Sarens, of Wolvertem, Belgium, a recognized worldwide leader in heavy lifting and engineered transport. “Our strategy included using self-propelled modular transporters (SPMTs) to move the jacket in a horizontal position approximately 262 ft. to the up-ending location at the harbor,” said Andrew Hunt, operations manager for Sarens. For the delicate task of lifting the jacket substructures into their vertical position, given the unpredictable weather at BIFAB's Methil facility, Sarens relied on four of its most trusted pieces of crane equipment. 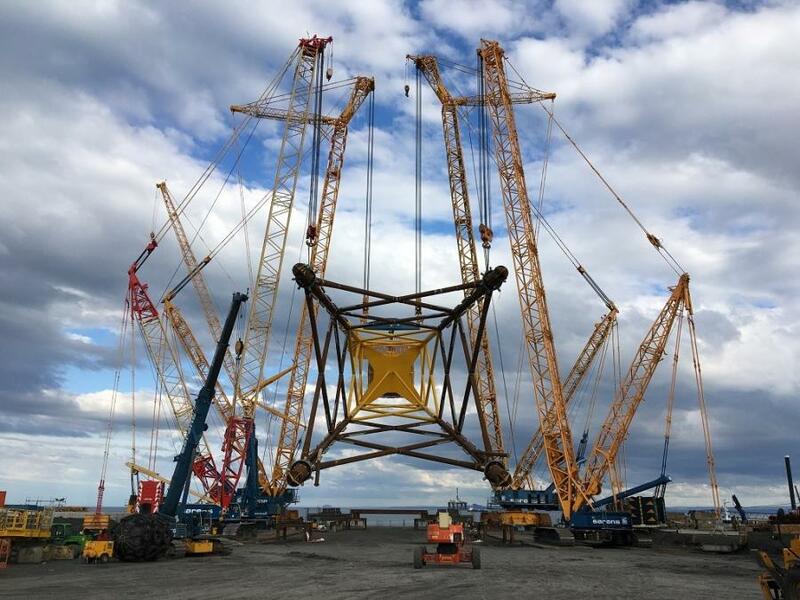 “We used our Demag® CC 9800 and CC 8800-1 crawler cranes to carry the main load and smaller cranes, one of them a Demag CC 2800-1 to help finesse the jacket into its vertical position” continued Hunt. Following closely behind the 1.7-ton capacity CC 9800 crane, the Demag CC 8800-1 arrived from a project in Bremerhaven, Germany. The CC 9800 and CC 2800-1 cranes helped to offload and rig this second 1.7-ton class crawler crane with 295 ft. of main boom, 59-ft. fixed jib and Superlift configuration with 705.5 tons of counterweight. “We had the CC 8800-1 rigged, tested and commissioned in about 7 days,” adds Hunt. With the crane equipment and 78 axles of SPMTs in place, Sarens was ready to lift the first of 10 jackets planned for installation in 2017. An additional 16 jackets are planned for fabrication and installation spring of 2018. The four SPMT operators transported the 1.13-ton load 249 ft. to the quayside up-ending location. “This step took approximately two hours to complete,” says Hunt. Working at a 65.5-ft. radius, both the CC 9800 and CC 8800-1 respectively began hoisting the load in slow increments toward its final positon, slewing slightly during the process. At the same time, the two tail CC 2800-1 cranes attached to the bottom of the jacket's legs began to hoist, slew and track toward the two main lifting cranes. “For this operation, the the tail cranes were equipped with 216.5 ft. of main boom and 110 tons of counterweight and hoisted the jacket legs at a 82-ft. radius,” comments Hunt. As the offshore jacket transitioned to its vertical position, the load was transferred over to the main CC 8800-1 and CC 9800 cranes. The tail cranes started slewing the jacket into its final vertical position until the full 1.126-ton load was shared between the main lift cranes. In total, it took four crane operators and six banksmen 1.5 hours to up-end the jacket from its horizontal position. Up-ending the first of many offshore jackets so quickly and efficiently impressed all who were a part of the challenging lift. The wedge-shaped Boom Booster's design includes 36-ft.-long lower and upper adapters that flare out to a 32.8-ft. width, nearly three times the standard boom's width, to enhance structural integrity. Up to five, 32.8-ft.-long interior boom segments can be added to provide up to 236.2 ft. of lift-enhancing boom structure. “We plan on using the full 236.2 ft. of the Boom Booster for this project,” says Hunt.